Reduces operator fatigue and increases productivity. "Compared to traditional aerators, the quality of aeration with the "One & Done" 30" Hydro Aerator blows every other aerator out of the water! We completed 200 aerations using Billy Goat Industries' 30" Hydro Aerator for field testing during the 2014 aeration season. Soil conditions were normal and plugs pulled easily and were consistently good quality plugs. This machine's mobility is amazing; it gets into areas other machines can't and maneuvers around obstacles seamlessly. We experienced deeper cores when compared to traditional machines and the ability to slow down over bare spots to maximize core holes for speed bed prep is a plus. We used the machine for seeding and the lawns came in lush. Operator comfort was a pleasant surprise. The crew's arms did not feel like jello after a full day of operating. Combined with increased mobility and ease of maneuverability, this machine saved us time on aerations." "I cut my aeration time in half while putting more holes in the ground, pulling deeper plugs, reverse aerating, and never having to raise tines to turn. 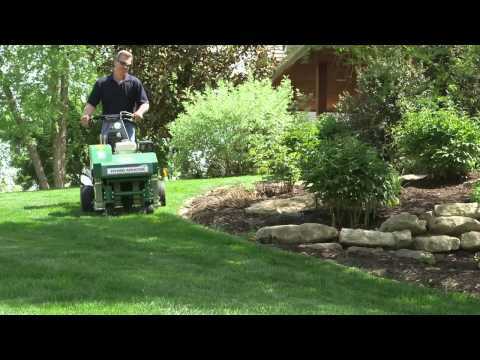 The "One & Done" 30" Hydro Aerator is a landscaper's dream! We completed 80+ aerations using Billy Goat Industries' 30" Hydro Aerator for field testing during the 2014 aeration season. Soil conditions including soft and wet to dry, rocky, clay consistency, and even muddy were experienced--none of which presented an issue for the aerator. Compared to traditional drum aerators, the Billy Goat hydro aerator pulls deeper plugs consistently, whether going forward or reverse and because the speed could be adjusted to put more holes per square foot, my crew saved time by not having to go over a lawn multiple times. The operation of the unit is far less fatiguing compared to traditional aerators because the machine does not have to be lifted to make turns and due to its hydraulic drive, requires less effort to operate and affords better control and maneuverability. An increase of approximately 50% in productivity was experienced while testing the aerator and this was the result of in-ground turning and maneuvering the machine in corners and small areas without having to raise tines, as well as not having to make multiple passes. Because the aerator is so easy to use and doesn't fatigue the operator, he is able to complete more aerations"
"Our crews argued about who was going to get to use the "big green machine" when we tested the 30" Hydro Aerator for a Billy Goat Field Test. They all wanted it on their trailer because it was so easy to operate. Nothing is more abusive to aerators than the rocky red clay found in Raleigh, North Carolina. I have tried every type of aerator available. In the problem areas on our lawns, we use the aerator to prepare a seed bed. Barrel aerators are ineffective when it hasn't rained for a few days. We have been successful with one of the cam action aerator, but we also became experts on repairing it every night when things were dry. Billy Goat approached us with a new type of hydro-driven reciprocating aerator with unique arms and asked us to test it for them. When completing 652 aerations in the fall season, with dry conditions, we were going through a set of tines every 3-4 days. Fortunately there are only eight per machine with only four bolts to remove to replace them, which saved time. The machine was easy to maneuver and even aerated in reverse. With hydro drive, we controlled the ground speed so in the problem areas we could "prepare our seed bed" in virtually one pass. By the end of the season it was easy to surmise that the machine not only held up to our conditions, but also significantly improved our productivity with less operator fatigue." "After a couple hundred aerations, we found this machine exceeded our commercial design expectation, gave us the increased productivity we were looking for and the crew loved it.Billy Goat Industries approached us to be part of the test and development team for a new type of hydro aerator (30" Hydro Aerator). Before they even started we told them this future unit had to be faster, low service, include in-the-ground steering, be able to do patch and repair work in one pass and be user friendly -- figuring they couldn't do it, or maybe only some of it, would be great. We received the prototype to test for an entire aeration season and were amazed at and pleased with the performance of this machine." "Nothing on the planet can pull as many plugs in a single pass! The Billy Goat Hydro Aerator will absolutely SMOKE any rolling tine aerator on the planet with the industry's highest plug count in a single pass. It absolutely ROCKS! The 30" Hydro Aerator delivers an unbeatable amount of plugs pulled per square foot and optimal plug depth in combination with intuitive and easy to use hydro drive controls simply making this machine a joy to use. The Hydro Aerator is an incredible renovation tool for over-seed preparation."